The play is directed by actor Roshan Mathew, and has in its cast many known actors both from theatre and cinema. An hour long recording begins and ends in laughter. The recorder is in the middle of a room, eight people sitting around it. The man in the middle pushes it away to the others around him – let them speak, he says. The day before, he had walked up the stage of Nishagandhi Auditorium, Thiruvananthapuram, at the end of an hour and a half long play he'd directed. That’s when the crowd recognised him – isn’t that Roshan Mathew, the actor seen in films like Aanandam and Koode? They were surprised to see him appear in the role of a director, introducing his brilliant cast that’s just won a round of applause and many rounds of laughter, after the first ever staging of A Very Normal Family. But Roshan has been doing theatre for a long time, nine years he says, and after coming to Kochi and getting busy with films, he simply missed it. Missed being on the stage, missed theatre. Darshana, who, like him, had moved to Kochi, was also in a similar state. You’d have seen her as the smiling, singing friend of Aishwarya Lekshmi in Mayaanadhi and the recent Vijay Superum Pournamiyum, the close friend of Nazriya in Koode. 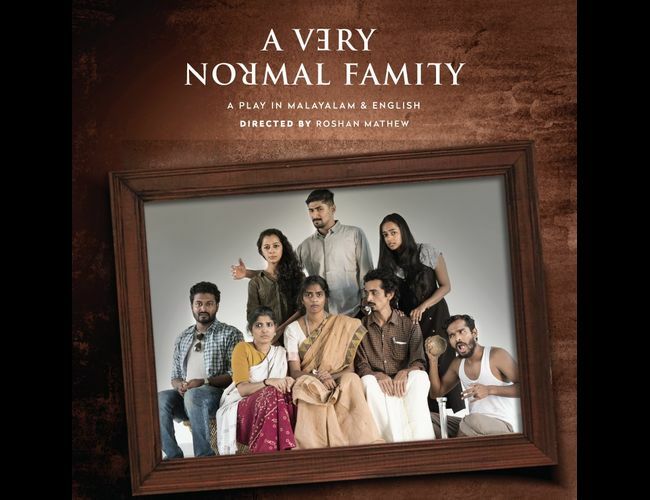 Together, they tried to do some theatre, spoke with friends, and made many plans till Francis, their writer friend in Kochi, decided to write the script of A Very Normal Family. “The best thing about it was how collaborative the whole process has been. We didn’t start off with a script,” says Santhy Balachandran, the actor who played Sweety in the play, one of the first that Roshan and Darshana fixed, watching her act in The Lover. Syam and Sanjay who were with Roshan in college – Madras Christian College – became two other actors, playing Jiku and Monai respectively. Siddarth, who was their senior, and whom Darshana knew as a theatre actor in Chennai, joined too. Then there’s Rajesh, another theatre and film actor, and Arun Kurian, Roshan’s co-actor in Aanandam. Kani and Divya Prabha were the last to join the team about a month and a half ago. Throughout the interview, one or the other of the actors would say, ‘Now these people have become my very normal family’. The family on stage looks very normal in the first few minutes – a typically conventional Christian family that Roshan says is perhaps in a small town, about two hours off a city like Kochi. Kani as Ammachi heads the family, Divya as Molly chechi playing her right hand. There are three children in the family, two of them married – Rajesh as James with his wife Sweety (Santhi), Jiku (Syam / Arun) the unmarried youngest, and Tina (Darshana), the daughter who is about to ‘bring bad name to the family’. She has just announced she’s filing for divorce. “It was a three sentence idea that I gave Francis,” Roshan says. He can’t reveal the other two lines, it gives away the suspense. The first line is this – about the daughter’s visit to the family, announcing the divorce, just in time for Easter, and the family’s reaction to it. Doesn’t take a lot to guess – the family does not like it, not one bit. Divorce is bad, unheard of, something that just doesn’t happen. Divorce brings gossip, affects your business and money. Divorce is a total no-no. The reactions are adorably exaggerated – that works in a satire. Perhaps it is the Ammachi-and-Molly combination that wins the most applause. The Ammachi who magically develops an Asthma problem every time the word divorce is spilled, and Molly chechi who keeps adding fuel to fire with her “casual” remarks. A character who often stitches one scene to another is Monai, Ammachi’s devoted but slow house-help, played by Sanjay. “But it is not the same Monai I played in May 2018 when I joined, he keeps changing, evolving,” Sanjay says. There was a point where it was almost staged but they could not find a producer. That’s when the Mathrubhumi Lit Fest happened. 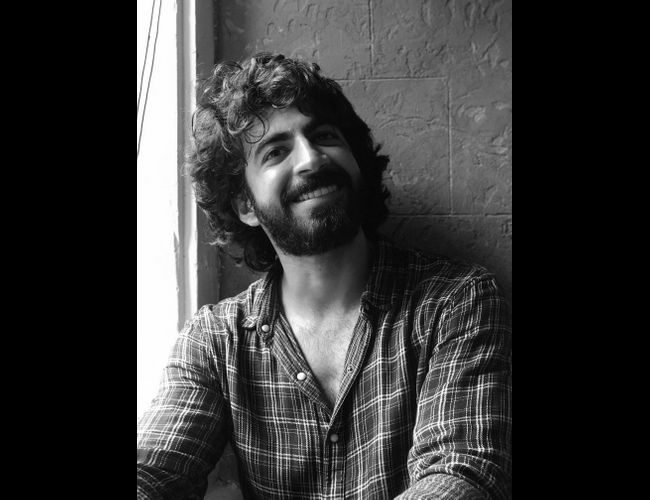 At the end of the play, Roshan had especially thanked the man who did the music – Seljuk, who prodded him to go on with the play when he first shared the idea. And the others - every one of his actors - have something to say about Roshan, the director. Darshana says Roshan would perform each character on the side when he thinks no one else was watching. Santhy is in awe of the clarity he has, the little things he tells his characters that would make a whole lot of difference. To Syam, he is a director who could make you think how to think for the character. Divya agrees, “He could even tell which scenes I like and which I don’t!” She and Arun are doing theatre for the first time. But you wouldn’t guess that watching Divya play the crazy Molly chechi. “At first we didn’t think she was crazy enough but during the audition she proved her craziness!” Darshana says cheerfully. Most of them have multiple projects to take care of – Sanjay is an RJ with Radio Mirchi, Divya has a film happening, Santhy has another, Syam had to run to the sets of 18am padi in between, Roshan himself was shooting for Thottappan. Only Sidharth says, “I had time, time is all I had.” He had quit his job in Chennai to be a full time actor, and plays one of the most significant characters in the play, Tom. “They are all significant. You can’t take anyone away from it,” Roshan says. The play has already got the next booking – 9th and 10th in Kochi, at French Toast in Kacheripadi. The little group that’s so obviously comfortable with each other and identifies itself as a very normal family might come together again for another project, anything creative, you never know, they say.